Earlier this year, I moved into a condo. Little did I know how much noise my neighbors would make or how little sound insulation there is in the wall. Note to Realtors, how come nobody ever advertises that they have sound insulation in the walls? Systematically, nobody lists that information. I could understand if there was no insulation and the Realtor says nothing, but if the house did have good sound insulation, I'd expect that to be advertised like crazy. Alas, after asking my neighbor to be quiet, which to his credit, he's done quite a bit, I can only do much before the only solution is to add sound insulation. Off to another home improvement adventure. After hours and hours of Googling, forum reading, sound insulation measurements and reviews, there is very little that can be done to an existing wall to improve sound insulation qualities. If you have a wall without insulation between you and your neighbor, the only good effective option is to tear down one wall and start from scratch. The kicker is that buying a new wall is very expensive. Why it is so expensive and how much sound reduction you need required quite a bit of researching. Sound is measured in Decibels (dB) and is a logarithmic unit. That means, going from 10dB noise to 20dB noise actually means that 20 dB is 10x louder than 10dB. To give you a sense of how loud things are, check out this chart over at Industrial Noise Control. 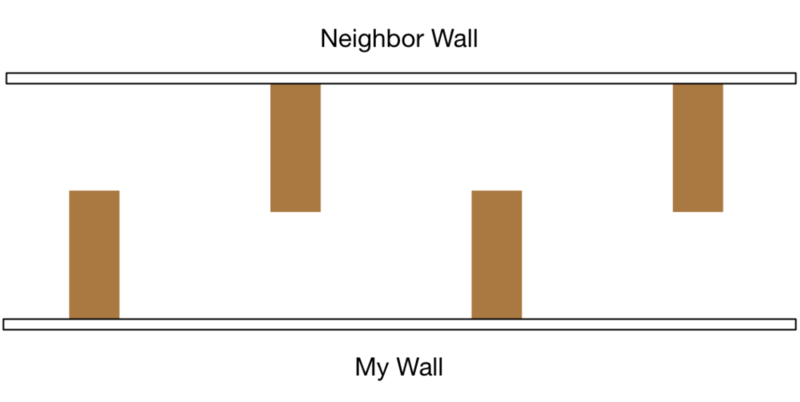 What we see is that in a normal living room situation, you're looking at noise on the other side of the wall ranging from 50 dB - 90 dB if your neighbor plays loud music. What you want, is to have your apartment be quiet, which means that the ambient noise should be roughly 40dB if possible. Taken to the extreme, if your neighbor makes noise at 90 dB, and you want it quiet on your side of the wall, you need a noise reduction of 50 dB (90 dB source - 50 dB reduction) = 40 dB ambient noise. This measurement, the reduction in decibels is called the Sound Transmission Class (STC). Most noise reduction products for home instruction are measured in STC. This is a laboratory measurement where a speaker is put on one side of a material and a microphone is put on the other side of the material. The measured reduction in decibels is the STC rating of a material. Standard drywall, which is what you think of when you see a wall, has a measured STC rating of ~33 STC, which is almost nothing. This is what people call 'paper thin' walls and you can still hear your neighbors talking. STC ratings are also not linear, as in having one layer of drywall rated at STC 30 and adding another layer of drywall does not equate to an STC rating of 60. It may only improve STC ratings by 2-3 points. In addition, sound is like water and doesn't only travel through the wall. It can travel around the wall, through the floor, through the window, etc. Real life STC ratings (in the field), are usually 10-15 points lower than the rated material. The question then is, if we want a quiet place and we know we need an STC rating of 50, how do we get there? Normal walls have an STC of 25 in the field. Multi-unit buildings usually by law, have to have a minimum of 50 STC materials between the walls. Luxury hotels and luxury multi-family units have STC ratings of 60+. They have sound insulation in mind and build concrete in between walls, which is an excellent sound blocking material. Dedicated home theaters, where I actually found most of the best information on sound insulation, try to get STC ratings of 60+. There is a large problem with STC ratings though, in that they are the average of 16 frequencies of sound. The frequency of sound is defined in Hertz (Hz). If you go back to physics class, sound is a wave. Frequency is how often the wave's curve repeats every second. 1 Hz means a wave oscillates every second. 5000 Hz means a wave oscillates 5000 times. Higher frequency noises are usually higher pitched (someone screaming) and low frequency noises are lower such as bass from music. Almost everything I've read says that dealing with the high end frequencies is rather easy. Dealing with bass is the problem. My problem is that my neighbor has lots of bass, FML. In the end, to get a really high quality sound insulation system, we need a high STC rating wall that can also block low frequencies. An STC rating of 50+ is probably the minimum someone needs to get 'good' sound insulation and 60+ to get 'great' sound insulation. Second, the system has to be designed to cover low frequencies, preferably as close to 0 Hz coverage as possible. Thus, when digging into materials testing, looking at the data of how it performs over a variety of spectrum is more important than the single STC number. Sometimes, you'll see the Outdoor-Indoor Transmission Class, which measures lower frequencies down to 80Hz, but that is more rare. Now that we have the requirements, how can we build this and what materials do we need? Like all systems, the best built system fully understands what it's trying to solve. What we're trying to eliminate here is sound at all frequencies, but different materials block different sounds at different frequencies. Sound is a wave, that once it hits a material, turns into a vibration, then becomes a wave once it hits air again. The key thing is to lose as much energy while the sound is vibration as possible. Thus, mass is key when eliminating noise. The more mass a material has, the harder it is to make the whole material vibrate, and the better the sound insulation. In addition, transforming between air and a vibration forces the wave to lose energy, which blocks more sound. This is the general strategy sound insulation will take: adding mass and transforming vibration into air and back again. However, like all waves, we also have to worry about resonance frequencies. Resonance frequency is the frequency at which a wave's amplitude actually increases because two waves join together. Destructive interference, is the opposite of resonance frequency, and what active noise cancellation does. If you build a system, and the neighbor's noise is actually at the resonance frequency of the materials, we actually get worst sound insulation. This usually only occurs at lower frequencies, which makes eliminating bass even harder. So now that we know how to measure sound, we know what sound is, how do we build a system that can stop 90 decibel sounds? Specifically, how can we get a system that is STC 50+ in the field without concrete as most buildings can't handle that weight? First, we have to figure out how walls are built. A standard shared wall in a condo contains 2'X4's (studs, or 2 feet by 4 feet) or wood posts spaced either 16' or 24' apart. 16' spacing between each 2x4 is used if the wall is load bearing and holds up the structure. 24' Spacing is used if it is not load bearing. Incidentally, for noise insulation, 24' spacing is better, but I can't rebuild the whole structure and the standard is 16' spacing. This choice probably isn't up to you unless you're building a place from scratch. In many of the data reports for STC ratings on materials, you'll see something like: 16' or 24' o/c. The 24' o/c means 24 feet On Center, or spacing between the 2x4s. Between any wall, you'll have these 2x4s spaced evenly before anything is actually done on either side of the wall. Now we know what a basic terrible wall looks and sounds like, how do we make this better? 1) Decoupling - Reduce the vibration transmitted between walls. 2) Absorption - Have the air work through something between the two walls. 3) Add Mass - Make the vibrations in the wall lose more energy. 4) Damping - Make only parts of a material vibrate. We'll take each one head on and try to relate it to the principles of sound waves. Everything I've read says decoupling is the single most important and effective improvement you can do to improve sound insulation. As sound goes from one wall to another, it acts like water. It finds the path of least resistance. Sound travels from the air, turns into a vibration in one wall, stays a vibration through the 2x4, and converts out to waves through the other wall. Thus, even if you just add insulation between the 2x4, it does very little because the vibrations just ignore the insulation and transmit via vibration. Decoupling fixes this problem my inserting a space between the 2x4 and your wall. Thus, the sound from one side has to turn into a vibration, losing energy, travel through the 2x4, translate back to waves (lose energy), convert back into vibrations when it hits another wall, then translate back out to waves (lose energy). A Double Stud Wall, the best decoupling strategy if you haven't built your wall yet. A Staggered Stud assembly, pretty good choice. However, since my condo is already built and I can't tear down the neighbors wall, only my own, this doesn't work either. Thus, the only way to decouple the walls is what's called a resilient channel. Up until the 1980s or so, resilient channels were the best way to get sound insulation in luxury apartments. The prices have come down a bit so it's possible to use them today if you can't do a double stud or staggered stud installation. A resilient channel is a metal bar. Each metal bar is installed horizontally along the wall. Each metal bar is screwed into the 2x4. Then your drywall gets screwed into the metal bar. Now your wall is decoupled from the other side as they do not share the same 2x4. In addition, the resilient channel can flex, which means the vibration energy is lost as sound travels through the resilient channel to your wall. The best metaphor I found was imagine sound being like a baseball. If you throw the ball at concrete, it bounces right back without a large loss of energy. If you throw a baseball at a hanging curtain, the curtain moves a bit, and the baseball just falls to the floor. The resilient channels are like the hanging curtain that absorb the vibrations by slightly moving. The biggest problem with resilient channels, is that if the contractor installs a resilient channel incorrectly and screws the drywall into a 2x4 instead of the resilient channel, you lose large amounts of sound insulation and gain almost no sound improvement. This problem is called a short circuit. A wall with whisper clips and a hat channel instead of resilient channels. Since this a condo with a shared wall, I can only modify my side of the wall. Ideally, we'd be able to do this to both sides of the wall, but that's not the case here. For now, everything will just be based on my side of the wall. The other wall will be left alone with a 5/8" drywall. In the best case scenario, sound insulation would be installed on both sides of the wall. Some contractors or online communities just say they have no insulation and that's why their walls are paper thin. Insulation is the empty space between 2x4s. The problem is that the main culprit in sound is vibration, not insulation. Just adding insulation does very little. In addition, insulation's main purpose is heat retention, not sound elimination. However, once you decouple your walls, insulation greatly helps because the sound must travel through the insulation between the decoupled walls, instead of passing directly through the 2x4s as a vibration. Standard insulation is Fiberglass. The way fiberglass is rated is usually on thermal properties, noted as the R-Value, rather than sound insulation. The higher the R value, the better the thermal insulation. In many cases, what you'll see is R13 or R19 fiberglass insulation, which is fairly easy to get at Home Depot. Not much to say here other than, by the time you tear down your wall, insulation is super cheap. A wall with insulation, what people think of when they think "stuff is inside the wall". To sound insulate at the low frequencies, you need mass. The more mass the better. The reason mass works is because sound becomes vibrations and a lot more energy is required vibrate a whole board of concrete versus a board of cardboard. That's why luxury hotels with walls made out of concrete work so well: it's so heavy. Standard residential drywall comes in 1/2" or 5/8" thick pieces. There is even ultra light weight 1/2" drywall, which is probably terrible for sound proofing. Some materials manufacturers have specifically engineered materials that are a heavy replacement to drywall, such as QuietRock. QuietRock is actually a replacement drywall that is constructed of different layers of materials to include mass, as well as a compound in between the layers of material that absorbs vibrations and turns it into heat. QuietRock is quite popular in some home insulation shows because it is easy to install. With basic QuietRock on one side, you can get an STC rating of up to 49. The compound between the layers actually leads us to the final principle of sound proofing: damping. A layer of Green Glue between two layers of drywall on one side of the wall. A pretty good damping material. The inevitable question comes up, should I get two layers of drywall and Green Glue in between or a single piece such as QuietRock? From what I've read, the performance of eliminating high frequencies of both materials are equivalent, but the low frequencies are where two layers of drywall and Green Glue wins. The reason is that mass is the most effective tool against low frequencies and QuietRock just isn't quite as heavy as two layers of 5/8" drywall. The other problem occurs because of resonance frequencies, which I spoke about earlier but can finally get into. Courtesy of Trademark Soundproofing. The effect of adding mass on the resonance frequency. For many materials, the low frequencies hit the resonance frequency of the material, which means that the material actually vibrates with the incoming sound, producing worst performance and annoying you more. To lower the resonance frequency, you need to add more mass. Lowering the resonance frequency essentially shifts the performance curve left, so lower and lower frequencies are required to induce resonance. This is also the reason two layers of drywall and Green Glue outperform QuietRock at the lowest frequencies: it just adds more mass and shifts the resonance frequency lower. Ignoring only 40 Hz and below frequencies are a lot better than ignoring 80 Hz frequencies and below. You double the range of blocked frequencies! As a side note, if you start researching sound insulation, you'll invariably come across egg cartons, foam, and hanging tiles. These materials are used for sound redirection, not sound blocking. They are used in recording studios and places where you want sound bouncing back at a certain angle. They keep the sound IN, not keep the sound out which is what you want in your home. If you had access to the noise source, these materials would help, but unfortunately we don't control that and so I didn't dig much into those materials. Now that we know what we want, two layers of drywall, green glue in between the layers of drywall, Roxul Safe n Sound insulation, and whisper clips with a hat channel, are we all done? Almost! There are only two installation notes left. First is that sound is like water and will find the path of least resistance to cross a wall. Any holes will become flooded with sound, making the whole sound reduction useless. Many holes are in the wall that are actually required such as electrical outlets and ethernet ports. To stop sound from being transmitted through these holes, you can install QuietPutty behind the boxes holding the plugs, which stops sound from being transmitted through. I'm not quite sure yet if I need them on both my wall and the neighbor's wall, but I'll probably do both just to be sure. Finally, the last piece is the noise paths between drywall and existing walls. Since the walls go up next to each other, there is a small open slit between the pieces drywall. These can be sealed up with acoustic caulking such as Green Glue Noise Sealant. This sealant goes between drywall slabs, beneath and over the drywall as it touches the floor/ceiling, and on the sides where your wall meets another wall. Like all good things, it must come at a cost, and at a cost does it come. Now I understand why cheap builders just throw up a slab of 5/8" drywall without insulation. The cost to install one 4'x8' piece of drywall costs $8. For our solution, of two layers of drywall, whisper clips, hat channels, Green Glue, and Safe n Sound, costs ~$80 for one 4'x8' piece. That is eight times the cost. For my two bedroom condo, doing three walls, requires 12 pieces minimum of drywall, for a total of only $96. For a sound insulated wall, it will cost $980, just in materials. The amount of time is probably 2-3x to install as well. In addition, a single 5/8" drywall only takes up 5/8" of space along a single wall. If you dual layer drywall, plus green glue, plus a 7/8" hat channel, the whole installation takes up 2.125 inches of space. Along the whole wall, you're losing 1.5" of depth, which actually means your sellable square footage goes down, bad for a home builder trying to make money. This is another reason QuietRock exists. You get roughly the same performance except at the lower frequencies without the extra space. That's also why it's more expensive than the dual drywall / Green Glue solution. There is also no guarantee that this will actually work unless you remodel the whole room. At the moment, I'm only going to attack the main common walls, but then the vibration and sound might travel through the floor or the ceiling. This is called Flanking. How big of a problem is this is difficult to say. The hardest problem is the human brain because sounds which were once undetected due to louder noises might now become an issue. Finally, the last two issues are the triple leaf effect and hanging items. The triple leaf effect is the case where you have three walls instead of just two between two units. One would think more mass, more air, more energy dissipated == good! The problem with three walls is that the resonance frequency actually increases over two walls, producing worse results, especially at lower frequencies. Second, hanging items on walls that have good sound insulation is a big no no. On resilient channels, this becomes a short circuit. Hanging an item on the wall or inserting a nail into one essentially opens up a new hole for sound to travel through, basically skipping the sound blocking of the wall. How big of a deal is a single nail in a sound insulated wall is still difficult to say. The hopefully final construction. Whisper Clips, Hat Channels, Roxul Safe n Sound insulation, A layer of drywall, Green Glue, and another layer of drywall. I haven't been able to find lab tests in this exact configuration. The closest I've gotten to is just Resilient Clips with two layers of drywall on both sides, Roxul Safe n Sound insulation in between, resulting in an STC performance of 55. The Green Glue should help at lower frequencies and help recover STC ratings from short circuits in the installation, bumping up the STC rating 2-3 points. Whisper clips bumps up STC up to possibly 60. The target STC rating of this installation should be high 50s, with a reality STC rating of probably high 40s. The OITC rating will, which targets low frequencies such as bass will increase from high 20s to high 30s / low 40s. Here's a video on how much work is involved to tear down drywall, install QuietRock, and put everything back together. I think the best part of the video is just seeing how everything should work and look when you tear down a wall. I don't know if this will actually work and I'll be able to sleep, but if this doesn't work, time to move.